Coffee brewed with a French press is dense and rich, yet it has its own sort of elegance. As with any method, the devil is in the details: To achieve a full expression of the coffee, decant it immediately after brewing so it doesn’t become bitter or chalky. It only takes four minutes to brew. 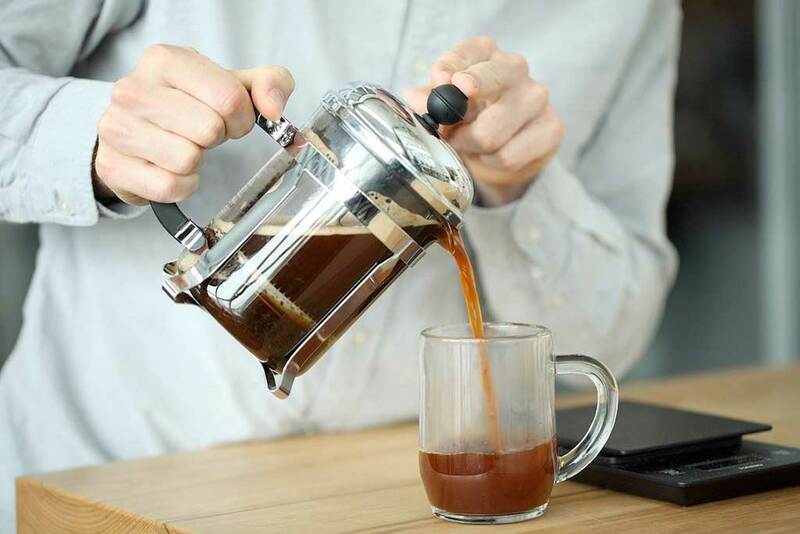 Before you brew, make sure your French press has been thoroughly cleaned since you last used it. Any old grounds stuck in the mesh filter will ruin your coffee with bitter flavours. Bring enough water to fill the French press to a boil. For a 500ml press, you’ll need about 350 grams. While the water is heating, grind your coffee. For best results, we recommend starting with whole bean coffee and grinding it immediately before brewing. If you grind your coffee too soon, it will quickly lose many of the compounds that give it such delightful aromas and flavors. French press coffee calls for a coarse, even grind. We recommend starting with a 1:12 coffee-to-water ratio. If you are using 350 grams of water, you will need 30 grams of coffee. To start, smoothly pour twice the amount of water than you have coffee onto your grounds. For example, if you have 30 grams of coffee, you need to start with 60 grams of water. Give the coffee grounds a gentle stir with a wooden paddle or chopstick. Let the coffee bloom for 30 seconds. Add the remaining water and position the lid gently on top of the blend. Do not plunge the lid just yet. Let the coffee steep for four minutes. Gently press the plunger all the way down to filter the grounds from the coffee. If it’s hard to press, your grind is most likely too fine. If the plunger moves immediately down to the floor, your grind is too coarse. The applied pressure should be 15–20 pounds. When you’ve finished pressing, serve the coffee immediately. Don’t let the coffee sit, as this will cause it to continue brewing and over-extract – making it turn bitter.